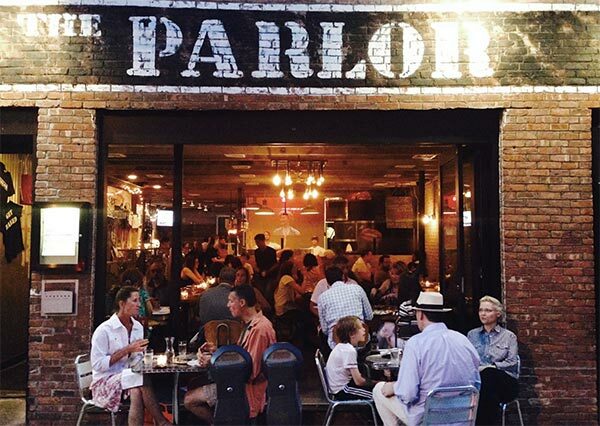 The Parlor is a wood-fired pizza joint located in Dobbs Ferry, NY. Here Chef/Owner David DiBari spins his unique take on Neapolitan pizza, as well as progressive small plates and craft cocktails. The colorful graffiti-tagged walls with contributions by local street artists and an upbeat soundtrack create a fun, energetic vibe. The Parlor, which received an “Excellent” rating by The NY Times, is open for lunch and dinner Tuesday — Sunday. DiBari is also Chef/Owner of The Cookery, an Italian gastropub located just down the road from The Parlor, and DoughNation, a mobile wood-fired pizza truck that serves perfectly blistered Neapolitan rounds at private parties and corporate events throughout Westchester and the Hudson Valley. © The Parlor.All Rights Reserved.